Hotone's Performer Series Professional Stompboxes have been designed by and for musicians to be the best tone shaping tools for the stage and studio. Featuring a compact, yet rugged aluminum chassis, 100% analog circuit and other carefully chosen components, these stompboxes are built to produce high-quality sound and wide tonal range in any performance situation. Each Performer Series stomp offers a dual footswitch design, as well as multiple I/O options for connecting to PA systems, audio interfaces, mixers, amplifiers and more. 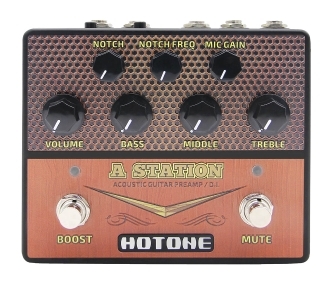 The first stompbox in the Performer Series is the A Station, a powerful acoustic preamp with D.I. If you play an acoustic instrument (guitar, violin, mandolin, etc.) the A Station is the ticket to make your tone really soar. It also offers a microphone preamp ideal for singers and worship leaders. A Station is also a must-have for venues where performers are consistently playing through the house PA system.